Use the form below to inquire about Plantation Villa Estate at Palampur . Use the form below to reserve for Plantation Villa Estate at Palampur . Each of the villas comprises of four bedrooms with attached bathrooms. The villas come with amenities such as a butler for each villa, private lounge, backyard, stone fireplaces and dining area. Looking for a cozy retreat close to the Himalayan beauty? This Plantation Villa Estate at Palampur is the right place to be. 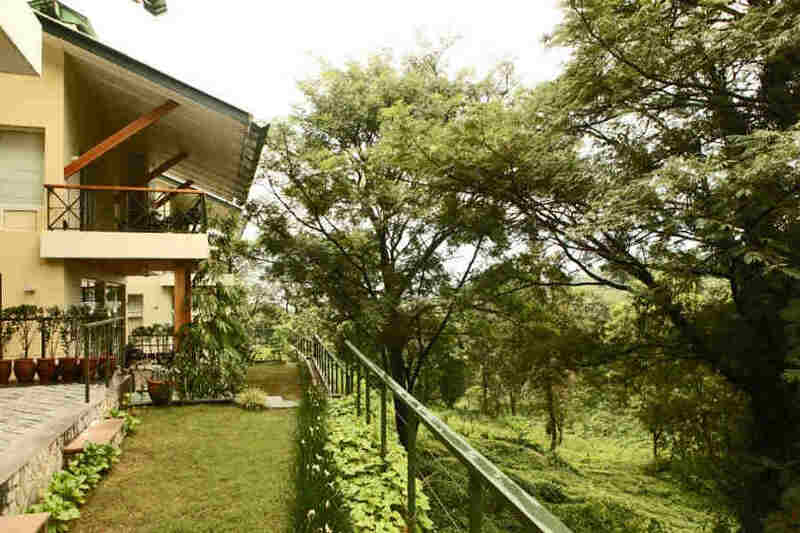 Seek solace from the humdrum of city life at this boutique Plantation Villa Estate at Palampur. Enjoy the calm and quiet of nature at this boutique villa that enjoys an advantageous position from popular tourist destinations like Dharamsala and McLeodganj. Located amidst the verdant Bundla Tea Estate, this charming property imparts the flavors of Himachal by offering you panoramic views of the mountainside. With a location so apt, it is ideal for tea garden walks as well as tea plucking activities where you can cater to the explorer, nature lover, and adventure seeker in you. Providing a backdrop of the Himalayan beauty and surrounding you with the aroma from lush green tea gardens, the property reflects aristocratic architecture that talks of a different era altogether. To top it up, it is equipped with all modern facilities and has friendly staff to guide you through a number of activities and sightseeing options. Each of the villas in this Plantation Estate at Palampur comprises of four bedrooms with attached bathrooms. The villas are elegantly built and spacious enough for a comfortable stay with amenities such as a private lounge, backyard, and dining area. The beautiful and well-maintained garden in the property overlooks tea gardens and snow-covered Dhauladhar mountain ranges. North Indian cuisine is the specialty of its restaurant, with local Himalayan delicacies being the highlight of the spread. Personalized services are available with exceptional hospitality amidst the magnificent Himachal landscapes. Whether you are looking for a few days filled with tranquillity or an adventurous getaway filled with biking, trekking, paragliding, and camping activities, this serviced Plantation Villa Estate at Palampur will make your stay an experience to cherish. With mighty mountain ranges and sprawling plantations for a company, you will never feel a dull moment here. Each villa has 4 bedrooms and can accommodate 8 people. If there are only six or four guests, one or two rooms will be locked, respectively. Children below 5 years will be accommodated free of cost. Children between 6 yrs to 14 years will be charged Rs.1200/day with extra bed. Above 14 years will be considered adult & Rs.2500/day will be charged inclusive of bedding & breakfast. Palampur is a hill station lying in the Kangra Valley of Himachal Pradesh, the tea capital of Northwest India. Thus, activities surrounding tea plantations ought to be an integral part of the stay at the luxury villa and rightly so. If you want to enjoy the facilities at the villa, you can avail butler services or relax by the private lounge. For those interested in breaking a sweat, tea garden walks, tea plucking, and visits to pine forests are arranged. Palampur has a gorgeous landscape that provides a delightful treat for nature lovers and adventure seekers. Engage in day tours at Bir, trout fishing, and birdwatching at Pong Da. Or rekindle the travel bug in you by taking scenic rides on the local train or hopping in for bicycle tours around the valley. Those who want to cater to the adrenaline rush can take up outdoorsy activities like paragliding, camping, cycling, fishing, water splashing etc. If you are interested in pottery, a walk through the jungle or a picnic by the gurgling rivers and streams, that could be arranged as well. From a trip to nearby monasteries and Dharamshala to a visit to the Naam Art Gallery, Andretta Pottery or Sobha Singh Art Gallery, your options are plenty when it comes to outdoor activities. Stay: Plantation Villa Estate at Palampur Address: Village Lohna, Palampur.